And thus begins the planning for the Hopkinton to Boston College Training Run of 2016! The run is this Saturday, March 26th, meeting at Brueggers at 7AM, arriving in Hopkinton around 8AM, finishing in Boston between 11AM and 1PM. On this post I’ll be coordinating the list of drivers, runners, and post run revellers of this year’s extravaganza. What I need to know, by replying to this message, is who will be a dedicated driver, who would like to run half the route and drive half the route, and who is running the entire route. Also, some of you will have special requests. While these are sometimes difficult to accommodate, every effort to make things happen the way you’d like will be considered. Also after the run we’re planning on having a pasta party with food from Comella’s upstairs at the Knights of Columbus. I’ll collect $10 per person to cover the cost of food. Beverages will be available at the bar. If you are interested in attending the post-run celebration please let me know that too. Please review the plan and let me know what I screwed up! See you in the morning!!! This week we’ll be strolling past ponds and flying over hills as we cover about 18 miles or 11 miles, depending on what you’re training for. We’ll be in from Brueggers. For those that haven’t met there before, please be considerate of the workers and patrons of Brueggers. Do not block access to the cash registers or get in the way of where customers need to be. They have graciously allowed us to meet there for 10 years now without any major complaints. Let’s keep it that way. The route will cross Main Street and run up East Foster to Melrose Common. Turn right onto 6th Street, and follow that as it turns into Swains Pond Avenue. As you come up to Turner’s Pond, turn right at the stop sign to continue on Swain’s Pond Ave. Follow that to Lebanon Street, where you’ll turn right. At the next set of lights, turn left onto Forest Street, running past Oak Grove Cemetery, reaching Main Street in Malden. Across Main Street you’ll find the first water stop at Citizen’s Bank. After the first stop, head out of the other side of the parking lot onto Winter Street. Follow this past the Oak Grove MBTA stop to a 5-way intersection. Run straight across the intersection to Glenwood Street, which will wind its way over to Highland Ave, where you’ll turn right and quickly right again at the Highland Ave traffic circle onto the Fellsway East. Take this over to Grimsby’s and continue straight onto the LynnFells Parkway. Keep on moving along to the next water stop at the knoll across from the Melrose Middle School. The next section continues out the LynnFells Parkway. Running the shorter route? Turn right on Melrose Street and right again on Main Street and make your way back to Brueggers. Running the longer route? Keep on going to the Saugus entrance of Breakheart. There you’ll find your next water stop. After that stop, you know what you have in store for you… run around Breakheart in which ever direction you prefer. When you’re done you’ll find the water stop waiting for you right where you left. Head back out to the LynnFells Parkway. Follow that back to Melrose, back to the knoll, back for your final water stop. Next stop Brueggers. Get there by running along the LynnFells Parkway to Grimsby’s. Turn left on West Wyoming and make your way to Main Street. A left turn there will bring you back to Brueggers. As far as water stops go, I’ll handle the first stop and the stop at Breakheart. I see Barry Cossette has volunteered to leave a car at the knoll. That should be all we need. Thanks Barry! This week, who’s in? Roll Call! This week we recover from the 10 and the 20 milers from last week… unless of course you’re running the Black Cat 10 or 20 Miler in Stoneham. If you’ll be joining us you’re be meeting at Brueggers at 8AM on Sunday. Yeah, you heard that right! Brueggers is back! The route this week is rather simple. Run up Main Street to Wakefield. Look for a water stop at Nick’s Pizza, across from the Jiffy Lube. After a stop there, loop Lake Quannapowitt. Continue up Main Street, through Wakefield Center. Running short? Bear left at Wakefield Center at Wakefield Common onto Common Street. Turn left at the church onto Church Street. When you hit North Ave head… wait for it… no, not north, head south on North (left) back to Nick’s. After a stop for some water head south on Main Street back to Melrose, back to Brueggers. Running long? Keep on Main Street as it takes you along the east side of the lake. Bear left onto Lowell Street, then turn left onto Quannapowitt Parkway and follow the path past the Comverse building, over to North Ave. Turn left and run along North Ave until you get back to the Nick’s Pizza water stop. After the stop keep going straight onto Nahant Street. That will bring you out to Farm Street, where you’ll cross and head up Hemlock Road past Wakefield High School and up to the Northeast Metropolitan Regional Vocational High School (The Voc). Keep going straight and you’ll find the entrance to Breakheart. Do a loop of Breakheart, counterclockwise. You’ll find a water stop at the Headquarters on the Saugus side. After the water stop keep going counterclockwise along the flat side of Breakheart, bearing right at the pond, bringing you back to the Voc. Bop out of the woods there and trace your steps back to Nick’s Pizza, down Hemlock, across Farm, along Nahant. Back at Nick’s have yourself one more drink of water. Time to head back home, south on Main Street, into Melrose Center, and home to Brueggers. Treat yourself after a good long run. Water stops. This week Regina, Julie, and Lois will be providing water along the route. Enjoy. This week both groups will be heading out on one of the longest runs of their training. We’ll be heading over to Winchester where the shorter distance stretches out to 10 miles, just a 5k short of a half. The long runners will make it to the border of Arlington on their way to 20 miles. The weather tomorrow will be great for a long long run. Things will start out a little chilly, 30 degrees, with little wind. Dress light, start off a bit chilly, you’ll warm up as you move around and the temperatures rise up to 40 degrees before your done. The longer training runs both prepare you for the distance, but they’re also rare chances to test your race day routine. Starting on Saturday eat like you’l eat before your marathon. Dinner and breakfast should be planned out in type of food, quantity of food, and time of eating to line up with your race experience as much as possible. Unfortunately Boston is one of those races with an odd start time, so its tough to line up to that one in time. What to wear. As you plan your clothes for tomorrow, try to include the clothes you might wear on race day. Test your shoes, test your socks, test your shorts and shirt. Again race day weather might be warmer than early March weather, but try to test as much as possible. Speaking of shoes, this run is a good time to turn over those training shoes and see how worn they’ve gotten. I liked to buy a pair after the 20 mile run, either to break them in for the race or to use for runs other than long runs to conserve miles on the ones I’ve trained in so they don’t wear out before race day. Ok, time to run. We’ll leave the Knights and head down Main Street in Melrose to West Wyoming, taking a right and heading up past Grimsby’s, up Pond Street to Spot Pond. Go right there, running past the Stone Zoo, crossing Main Street in Stoneham past Friendly’s, past the entrance to I93, onto Park Street to a set of lights. You’ll turn left at the lights onto Marble Street which will take you up and over I93 into Winchester. The road will change names to Forest Street there, take a look to your left on Eugene Drive and you’ll find water stop 1. After that water stop the whole group continues on Forest into Winchester, down a nice hill. You’ll see a H sign pointing you left onto Highland Ave towards Winchester Hospital. Take that left, but don’t stop at the hospital, you’re doing fine. Keep running straight on Highland Ave. If you’re running long you’ll run through a 5 way intersection continuing straight on Highland all the way to the end to water stop 2. If you’re running short you’ll turn right at a little park on the right side of the road onto Eaton Street. This will take you down a hill to Washington Street. Take a right there and follow it to a set of lights at an intersection with Forest Street (where the other Gingerbread Construction Company is). Turn left on Forest and run all the way up (yes, time to pay back for those hills you’ve been running down), up, up to the water stop at Eugene Drive again. After that stop shorter distance runners will run back the way you came, Marble Street, right on Park, follow straight back to the zoo and Pond Street, turning left on Pond to Wyoming back to Main, back to the Knights for 10.2 miles. Longer runners, you’re still standing at water stop 2 wondering what to do next, aren’t you. Turn left on Main Street in Winchester/Medford (RT-38). Cross over to the other side of the road at some point, you’ll be turning right at Oak Grove Cemetery onto Playstead Road. This nice wide road will take you past the cemetery, past a soccer field, along the commuter rail to High Street in Medford (RT-60). Take a right, crossing over the tracks, and note the DD across the road, a historically runner-friendly bathroom stop. High Street will take you over to the Mystic Lakes. There is one spot where the road appears to fork, stay left to stay on High. You’ll eventually hit a little rotary at Mystic Valley Parkway. You’re pretty far from Melrose Center now, on the border of Arlington. Turn left right onto Mystic Valley Parkway to start heading back home. This will take you past the pretty lakes. Keep running to the end of the road and turn right onto Bacon Street. Yes, you’ll be hungry and think “Bacon!” at this point. Never fear, Bacon takes you under the commuter rail and on your left is a turn back on to the Mystic Valley Parkway. Along this road you’ll find water stop 3. Half way done! The next stretch skirts Winchester Center, following the Mystic Valley Parkway to the next set of lights where you’ll turn left on Washington Street. This will bring you to another 5 way intersection. Cross Mt Vernon Street and stay left to keep on Washington Street. If you run past Winchester High School go back and try again. You should be running past a few churches. Follow Washington all the way to the Gingerbread Construction Company. No muffins for you though, turn right on Forest and head all the way up, up, up (it feels like three big hills) to Eugene Drive for your next water stop. Ok, only two more short runs to go. Keep on movin! Leave this stop, crossing I93, and take a right on Park Street at the lights. Follow this back to Friendly’s and turn right at Main Street in Stoneham. This will take you along the Fellsway West behind Spot Pond. Run to Elm Street, where you turn left to bring you up to the rotary at Highland Ave in Medford (its a full house, three Mains and a pair of Highlands). Turn right onto Highland and find your last water stop of the day. Leave the last water stop and head down Highland all the way to the traffic circle at the other end, where the paper boy hangs out. Turn left on the Fellsway East (a pair of Fellsways too). This will take you through my version of Heartbreak Hill. 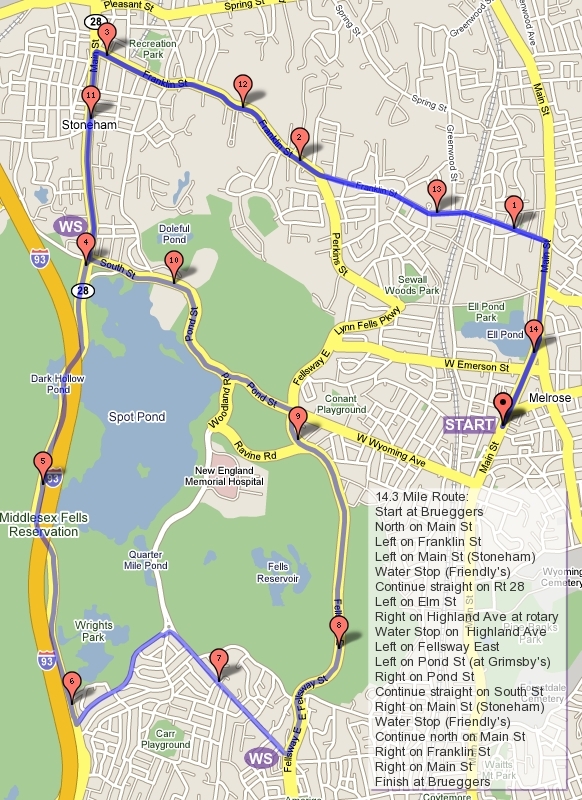 These are about where you’ll hit the hills in Boston. Keep your chin up and charge through them. Use the down hill to invigorate you as you turn right at Grimsby’s and proudly stride down West Wyoming returning to Main Street to chalk up a 20-miler! Big run for everyone. I need an army of water stop volunteers for this one. We’ll all meet at Eugene at 8:15ish. I need someone’s car to stay there for water stop 1/4. If you want to run you can leave your car there and get in just over 9 miles if you start and stop from there. Typically the water stop 2 helper at Highland Ave can scoot over to the other Highland Ave for water stop 5. Water stop 3 along the Mystic Valley Parkway near Winchester Center, I’d like someone who has run the course and is not directionally challenged to handle that one. Usually runners need some directional reminder on how to get back to Eugene from there. Who can help. We’ll have to open up the Knights for the shorter route runners again, so I won’t be able to contribute to waterstop duty as much again this week. Ok, 3 or 4 volunteers, who can help? Brueggers update: They’re opening this week. They’ll be hosting a soft opening event while you all are out running. I’ll see if I can check it out and see how things might work for us for the remainder of the season. One last note: if you feel you will need more than two or three Gus during our run, I suggest you bring some extras with you. Your $2s can’t cover much more than that per run. Thanks. Ok, how many runners do we have for the big ones this week? ROLL CALL!